ARCHICAD 21’s iconic signature building is Sydney University’s new Charles Perkins Centre. This leading research and education hub offers the next generation of researchers and practitioners – working in the fields of obesity, diabetes and cardiovascular diseases – a place to collaborate, train, mentor, learn and inspire. The firm behind the Charles Perkins Centre, fjmt, is a multidisciplinary design studio and one of the region’s foremost and awarded architecture and urban design practices. fjmt is dedicated to design excellence, innovation and enhancing the public domain. fjmt, now owning 97 ARCHICAD licenses, was at the forefront of the industry in Australia, introducing desktop CAD and PDF workflows in the 1990s. In 2000, they felt the need for a 3D design and documentation package. After testing three candidates, they chose ARCHICAD mainly because of its Teamwork capabilities. Their initial expectation of the software was merely to support their architectural design and documentation workflows. Since then, they have moved far beyond their original plans and have become BIM experts while learning the process of using 3D DWG-based model coordination with consultants and contractors as a first step. In the 2010s, they started to work with IFC coordination on major projects all the way through the design and construction phases. Today, most of their projects follow the BIM workflow on a very high level, using the ARCHICAD building model as the database and dRufus software for the BIM data management of more complex buildings. Beginning in 2013, fjmt started to provide full BIM management services for the buildings that they designed both in the design and the construction phases. Upon completion of the projects, they are also able to deliver a facilities management model. fjmt also uses Rhino and Grasshopper – lately with GRAPHISOFT’s Grasshopper-ARCHICAD Live Connection – to provide parametric design and mass customization (producing a lot of pieces that are ‘similar but different’). The use of all these technologies enables efficient fabrication and assembly of complex designs. Located on the western edge of the University of Sydney Camperdown campus, the Charles Perkins Centre (CPC) is a six-story building (plus three basement levels) designed to foster collaboration and research in a holistic trans-disciplinary manner. The center is a purpose-built facility and Stage 1 of a newly identified Life Sciences Research Precinct. Balancing research and education needs, the design supports diverse disciplines such as biomedical, bioinformatics, computational as well as clinical research and social sciences. Within the 50,000 sqm building, over 16,000 sqm is dedicated to wet and dry laboratories. The design maximizes efficiency and flexibility, while encouraging collaboration and interaction between various research domains and project nodes. Open-plan office ‘neighborhoods’, a suite of core lab facilities and shared informal meeting spaces offer the next generation of researchers and practitioners a place to collaborate, mentor, learn and gain inspiration. The building form and elevations are considered in relation to the context and campus alignments including the Wilkinson Axis. Vertical proportions and rhythms of the north-west facade strengthen the harmonious relationship with the adjacent heritage architecture of St John’s College. Composed of a complementary sandstone, this façade is characterized by striated slot windows with deep reveals for articulation and shading. In contrast, the south-east façade overlooks a triangular open space with large expanses of glazing sub-divided by a series of natural brush-anodized aluminum horizontal louvres. Articulated layering of sandstone, glazing and aluminum characterize other façades while responding to internal functions and scaling of the building mass. A separate pavilion building with a sweeping roofline, adjacent to the main entrance, accommodates a café and access to the 360- seat auditorium. Biology of the human body, DNA sequencing patterns and blood flow inspired the overall architecture and interior design approach for the project. A large central atrium is the social heart of the building and is a place for gathering, interaction, sharing and impromptu casual exchanges. With a bold, sculpted form with horizontal continuous ‘ribbons’, the atrium sinuously diverges from floor to floor linking the balustrade, atrium stairs and screen wall. Views across and between the floor plates are optimized in circulation spaces and interaction zones around the atrium to enhance a sense of openness, connection and informal interaction without compromising security or disturbing lab activities. Primary floors are arranged in a deliberately simple arrangement to facilitate occupant and visitor orientation, with three horizontal functional ‘stripes’ signifying the laboratory zone, interaction/ meeting zone and the workplace zone. Warm, earthy colors and layered envirographics contrasts with the smooth, white balustrades and aids in visually articulating the various zones. The inherent flexibility, versatility, combination of materials, modulation, detailing and the reveal depths, along with a series of integrated sustainability initiatives – like high performance glazing, well thought out sun shading, the use of photovoltaic cells and the smart use of natural daylight entering the atrium – all combine to result in a bold, contemporary expression that respects the campus context and successfully accommodates not only the demands of today, but those of the future. A project this size always comes with challenges and opportunities. The Charles Perkins Centre was no exception. One of the special aspects was that two architectural firms (fjmt + Building Studio as architects in association) worked together designing and documenting the single stage project. Given that the building features numerous intricate details and interfaces, one of the challenges was to synchronize the work of the two teams. The collaboration process was in the form of IFC and exchange of orthogonal DWG files including: Floor plans, Sections and Elevations. The main challenge was the resolution of a multi-disciplinary building including workplace, education, high spec laboratory uses and clinical, with a large team, resulting in the production of multiple outputs for design purposes and construction in a timeand cost-pressured environment. A fast-tracked design and construction process is a ubiquitous ‘feature’ of the AEC industry, but in this case, it was further challenged by overlapped design, documentation and construction phases. As an example, early works documentation was produced ahead of base building design finalization, and ahead of interior conceptual design. The requirements also meant the creation of packaged documentation by trade. It was one of the first projects in ARCHICAD 13 for fjmt and the new Teamwork functionality of that version made a positive difference in team productivity. Allowing to reserve and modify individual elements in a quick way helped team members work by trade, by layer, by level or alternatively reserve a few related elements to resolve junctions and interfaces. “Teamwork was an invaluable tool that allowed our team to be flexible and productive. Team members could reserve and modify from various parts of the model, from the office and remote locations. ARCHICAD’s versatility allowed the dual production of design and documentation drawings and models, in the overlapped design and construction process. Digital models were used to explain multiple options in presentations, for consultant coordination and workshops with contractors, and helped to understand and resolve complicated 3D interfaces. The project had the early involvement of a contractor (Brookfield Multiplex Constructions), with fast-tracked design and construction packaged documentation. Models were issued as IFC’s, and BIM coordination was conducted directly with the sub-contractors for clash detection and the general coordination of structure and services. fjmt started the design with ARCHICAD 13 and finished it in ARCHICAD 15 with 20 designers and architects working on the project. The biggest modeling challenge was the full height atrium with complex servicing requirements featuring curvilinear profiles transitioning to two-way curved stair geometries. Whilst the architects achieved the design intent through a combination of tools and custom workflows, it should be noted that GRAPHISOFT has developed new tools since then that would have made their task significantly easier and faster. Specifically, the Rhino-Grasshopper-ARCHICAD Live Connection allows Rhino/Grasshopper and ARCHICAD to communicate directly in order to create and manipulate a BIM model in full or in parts through Grasshopper’s visual scripting interface. Furthermore, ARCHICAD 21 features the highly-anticipated Stair and Railing Tools, based on patent-pending Predictive Design™ technology with which the modeling and documentation of this complex-geometry structure would have been a regular process without the need for special solutions. 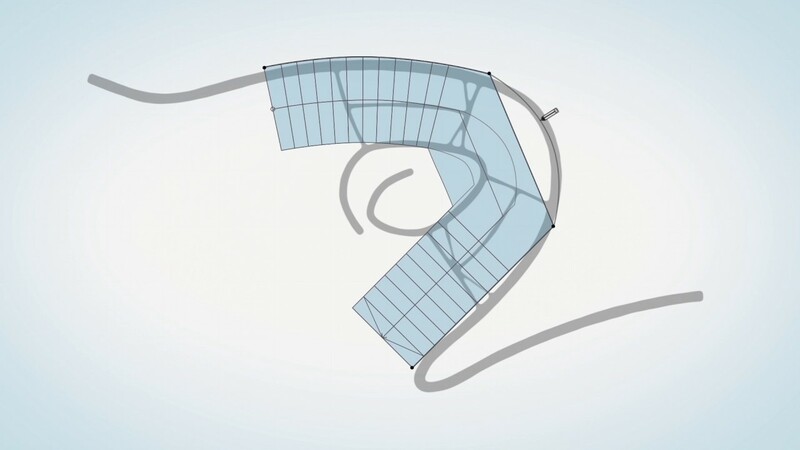 ARCHICAD 21’s Stair/Railing concept video featuring the Charles Perkins Centre illustrates the possible v21-based conceptual design process of its iconic staircase. Through a creative use of materials based on an innovative design concept and utilizing industry-leading software, fjmt have designed a world-class facility for the Charles Perkins Centre, that will serve researchers and educators for generations to come. fjmt is a multi-award-winning Australian architectural practice dedicated to design excellence and the enhancement of the public domain. Place and community are inseparable. Developed between these terms, each of our projects is a transformation and interpretation of the site to make visible the aspirations of the client and wider community for which we build. We seek to create form and public space that accommodates and reflects human appearance, values and ideas, and importantly extends to the public realm. fjmt has won numerous architectural and design awards including the World Architecture Festival ‘World Building of the Year’, the AIA ‘Sir Zelman Cowen Award for Public Buildings’ and the Lloyd Rees Award for Urban Design, the NZIA Architecture Medal, and the RIBA International Award. Through studios in Sydney, Melbourne (Australia) and Oxford (UK), fjmt undertake public, institutional, commercial and residential commissions throughout Australasia and recently in Europe. These commissions are frequently the result of international design competitions.